Reviews for "I Create My World"
"I’m in love with this little book – more to the point, I’m in love with the concept of providing children with positive affirmations, self confidence, and self worth. I Create My World; the Power of Thought to Shape Our Lives: a Book of Affirmations is a Kindle book for children that I wish I could put in every child in the world’s precious little hands. I don’t have to tell you how important self worth is, nor do I need to remind you how important it is to our happiness and even health to realize that we are..
worthy of love, happiness, and all things good! What I might need to remind a lot of people of is this: People need to be grounded in these truths very, very, very early in life. The first years of development are more important than most people realize. A lot of the beliefs, feelings, and thoughts we develop as very young children stay with us throughout our lives. That’s why the thought of a loving adult sitting down with a child and reading a book like this, together, fills my heart with warm hope. I read to my daughters (Emily, Brittany, and Stephany) from the moment they were old enough to listen. The time spent together was sweeter than any cupcake could ever hope to be. I found that it was often the words shared between us… between pages.. that were the most powerful. The same would be true with this delightful and colorful book. Think of the wonderful opportunities you’d have to instill positive life affirmations! Having a book as a “tool” helps immensely. The author’s words can guide your words, while the picture holds the child’s attention. I’m reminded almost daily just how strong children’s memories are. My daughters often bring up things that happened so long ago that my mind had nearly misplaced the entire scenario! They remember books we checked out at the library and read as soon as we got home, they remember lessons from our home school – all the way back to when they were 5 and 6. A few months ago, one of my girls brought up a story I’d made up when they were all younger than 8. They remembered the “moral” and even the illustrations I drew to go along with it! What a child experiences early in life helps mold and form them into the person they’ll become. It’s as though we provide them (when they’re very small) with the colors they’ll use to paint their life’s picture. I Create My World; the Power of Thought to Shape Our Lives: a Book of Affirmations is a beautiful palette of colors you can use to your child’s advantage!" Thank you so much, Joi, for your fabulous review!!! "Much has been written about the power of positive thinking and affirmations as tools to a better life. We may not be able to control the world around us, but we can control our thoughts, so why not choose positive ones? Another argument for positive thinking is that it sends out a happier vibration, and since most cats tend to pick up their humans’ energy, cleaning up your thoughts doesn’t just benefit you, it will also make your cats happy. 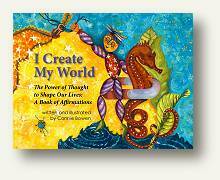 With I Create My World: The Power of Thoughts to Shape Our Lives, artist Connie Bowen has created a wonderful little book filled with affirmations and colorful, whimsical paintings. Even though the book is not a cat book, there are a couple of adorable cat paintings featured, which is why I decided to share this little gem of a book with you. The book is aimed at children, and it’s a great way to introduce young children to the concept of positive thinking and affirmations, but I think adults will be equally delighted by this lighthearted approach to the topic. I can’t help but believe that the combination of the words and the colorful images create a positive vibration just by looking through this book. “By repeating the affirmations in this book, we focus our thoughts on the highest vibrations of gratitude, harmony, and love,” writes Bowen in the foreword to the book. With an affirmation like the one above, accopanied by an adorable kitty, how could you go wrong? I also love the affirmation of letting your light shine brightly ever day and the painting below. There’s just something so happy about the girl sitting by a sunny window with her cat."